Pair Of F/A-18s Crash In Western Pacific Ocean, U.S. Navy Says : The Two-Way One pilot has been rescued and the search continues for the other after the two warplanes from the USS Carl Vinson went down. F/A-18 fighter jets on the flight deck of the aircraft carrier USS Carl Vinson in Hong Kong in 2011. The U.S. Navy says two of its carrier-based fighter/attack jets have crashed in the western Pacific Ocean. One pilot has been rescued and search efforts were continuing for the second. 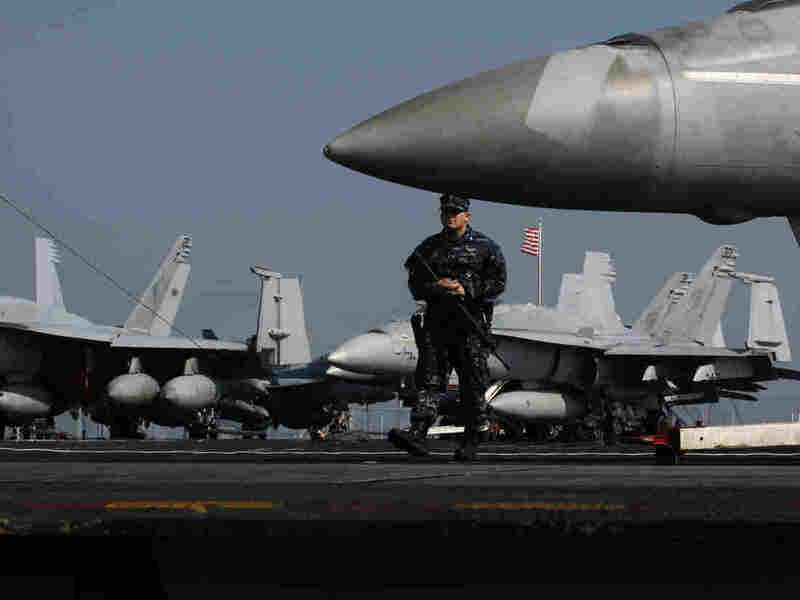 The cause of the incident, which occurred early Friday and involved F/A-18 Hornets from Carrier Air Wing 17 aboard the aircraft carrier USS Carl Vinson (CVN 70), was still being investigated, the Navy said in a statement. "The initial report is that the two aircraft are assigned to Strike Fighter Squadron 94 (VFA-94) and Strike Fighter Squadron 113 (VFA-113). "One pilot was rapidly located and returned to Carl Vinson, and is currently receiving medical attention. Search efforts continue for the second pilot. "The search for the second pilot includes guided-missile cruiser USS Bunker Hill (CG 52) and guided-missile destroyer USS Gridley (DDG 101) and helicopters assigned to Helicopter Sea Combat Squadron 15 (HSC 15) and Helicopter Maritime Strike Squadron 73 (HSM 73). "The two F/A-18C Hornets have not been recovered." Note: We've changed the photo caption, originally supplied by The Associated Press, to delete a reference to the figure in the center being a U.S. Marine. As several of our readers have commented, the serviceman shown appears in fact to be a U.S. Navy sailor.